United Nations, Sep 27 (Prensa Latina) Cuban President Miguel Diaz-Canel has been holding bilateral meetings at the UN with dignitaries from around the world attending the 73rd Period of Sessions of the General Assembly. On Wednesday late afternoon the UN Secretary General Antonio Guterres, who had been recently in Havana for a yearly event of the Economic Commission for Latin America and the Caribbean, welcomed Diaz-Canel for a one-to-one meeting. Before, the Cuban Statesman met Salvadorean President Salvador Sanchez Ceren who ratified his friendship toward Cuba that pushes forward fruitful cooperation with El Salvador on several fields. Diaz-Canel is carrying out a broad agenda of bilateral meetings at the UN where he’s attending the political high-ranking session of the 73rd period of the General Assembly. As of Monday, he has held meetings with his peers from Bolivia, Ecuador, Angola, Argentina, South Africa, Peru and others. In their speeches before the international forum, dignitaries have voiced their support to Cuba, among them Namibia’s President Hage Geingob who reiterated his call for an end to the US economic, financial and commercial hostility against the island. Mozambique’s Head of State Filipe Jacinto Nyusi said he joined other voices calling for the US normalizing political, diplomatic and economic relations with Cuba. The presidents of Ecuador, Lenin Moreno, and Mexico, Enrique Peña Nieto, also expressed their rejection to Washington’s blockade on Cuba. The Mexican politician said he was sure the end of the blockade will bring benefits to the entire region. 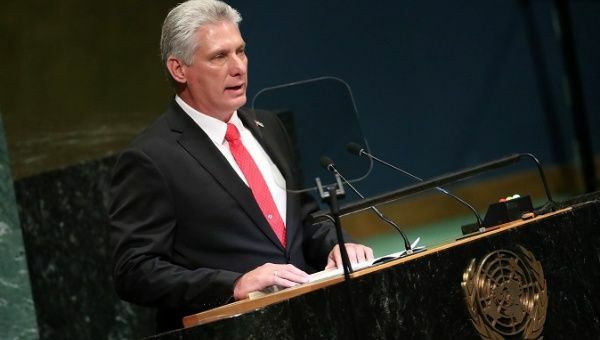 Addressing the General Assembly on Wednesday, Diaz-Canel denounced the US Government has been trying to choke the Cuban economy with the purpose of generating extreme poverty and disturb constitutional order. ‘It’s a cruel policy that is harming Cuban families and the whole nation,’ the Cuban President asserted. The Statesman wound up his packed Wednesday schedule with a friendly encounter with friends of Cuba at the Riverside church in Harlem, where the leader of the Cuban Revolution, Fidel Castro, was in 2000.